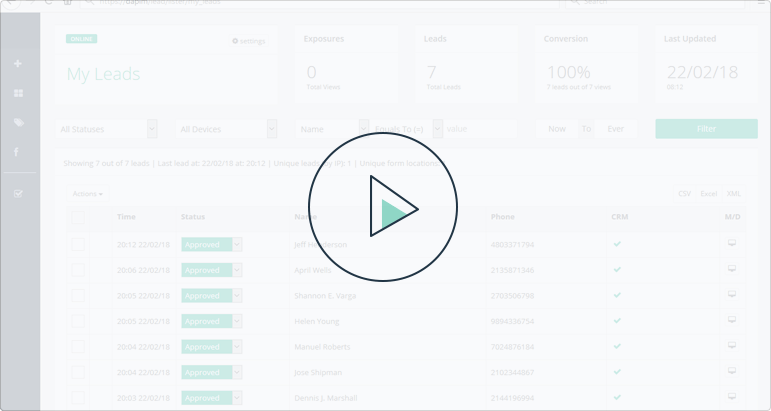 Hover Lead helps digital marketers to convert site visitors into leads, providing a GDPR compliant robust leads engine, Facebook leads sync, any CRM Integration and responsive leads forms implemented with a simple copy paste. Fully responsive leads forms that contain fields, labels, and messages adjustable to present perfect on any screen. Simple and easy way to integrate Facebook leads, helping you to sync leads from multiple Facebook leads Ads directly to your leads panel and CRM. Professional leads management panel designed especially for digital agencies and digital marketers, including advanced leads editing, status monitoring, leads export, filter, search, and more. CRM Integrator will report your leads in GET, POST, WebService or with a specific Email format, it includes an error reporting and a separate feedback status for each lead to insure acceptance. Tagging feature make it easier for multiple campaign and clients management, allowing you to filter, search and set different permissions for your clients, campaign, or any other group you desire. Using the best top 5 layouts for maximizing leads conversion with adjustable look & feel in colors, fonts and texts. Supporting UTM sources and query string parameters and collecting user metadata such as IP address, useragent, browser language and resolution to optimize and improve campaigns results. Invite team members to work on your campaigns, grant permissions, and limit access to specific forms or tags for even more control. Import leads with our autogenerated API instructions file or export your leads in Excel, XML, or CSV formats for use in other places. Use your Google Tag Manager account to add forms to a landing page or a website, enhanced your control on your leads forms appearance through your GTM account. Keep your lead generation running smoothly while freely changing and optimizing your creative. Collect leads from multiple sources, such as landing pages, websites, blogs, Facebook, online stores, and more. Benefit from highly optimized forms that were designed after years of A/B testing, and test your own form layouts for even better results. Create and implement your own Hover Lead forms and start benefiting right away – no coding skills or previous experience required! Use Hover Lead forms to control when and how your offers are displayed to your target audience for more optimized and time-sensitive campaigns. Keep your visitors focused on the main call to action with Hover Lead forms, which have been designed to be simple and prevent any distractions. The idea of using an independent lead engine which is separated from the web pages gives us the freedom to move fast with our clients' campaigns. We found Hover Lead to be the best platform for leads capturing and for Facebook™ Lead Ads management. It's amazing how a simple solution can save so much time and hassle. Since we have started using Hover Lead, we have totally stopped dealing with sync issues related to leads and CRM integrations. Choose a plan that fits your needs, and start using Hover Lead right away! You can get more! for higher quotas and less limitations - contact us for custom plans. Can I use Hover Lead for free? Yes, we offer a free plan. The free plan can help you to get familiar with Hover Lead and can also be a good start for collecting leads on a small scale. Do I need a programmer to use Hover Lead? No, Hover Lead is a fully hands-off solution.Our service is specifically built for people with no programming skills, so that you can add forms to your landing page or website as easy as “copy & paste”, or by connecting your form with your Google Tag Manager, which only takes a few clicks. Do you save my payment details? No, Hover Lead does not save your payment information. All payments are transmitted securely directly to the certified payment operator. We do not save your creditcard number or any other sensitive information in our database. For auto renewal purposes, we may save only a token string as a key provided by the certified payment operator. Can I change my billing information later? Yes, you can change your billing information through your user account at any time. Can I change my payment details? Yes, at any time you can change your payment details or change the payment method you are using through your user account. Yes, you can upgrade your current plan by clicking the “Upgrade” button in the left bar or through you user account. Can I extend the period of my current plan? Yes, at any time, you can extend your plan period by another year by clicking the “Extend Plan” button in your user account. Is there a limitation on the number of forms I can create? No, there is no limit, so feel free to create new forms as often as you need to. Can I get an invoice for this service containing my company name? Yes, after payment approval, we will send you an invoice to your email.In addition, you can download a copy from your user account inthe “Billing” section. Where do you store my site visitors leads? Your information and your leads are stored on Google Cloud Platform, which we have chosen for security and stability reasons. For security and stability reasons we have chose Google Cloud Platform as our infrastructure for Hover Lead, this means that all of your information including your client’s leads will be hosted on Google Cloud Platform which stands in the highest security specifications. Hover Lead is working under GDPR (General Data Protection Regulation) regulation by which the European Parliament, the Council of the European Union and the European Commission intend to strengthen and unify data protection for all individuals within the European Union (EU). When you or your clients sends Hover Lead information, such as your account credentials or leads from a website, we are always using HTTPS protocol when it is enabled. Hover Lead uses Google as the Certificate Authority for providing a secure communication between users to our application. We have found Google as the most trusted and reliable source for our users. The Google Internet Authority G2 is operated in accordance with the latest version of the CA/Browser Forum Baseline Requirements and it is signed by the GeoTrust Global CA, as described in Google`s Certificate Practices Statement.